An unprecedented survey by FGV’s Department of Public Policy Analysis (DAPP) based on data from the State Secretariat of Penitentiary Administration (SEAP) shows that, in the city of Rio de Janeiro, criminals typically take short journeys to commit crimes. 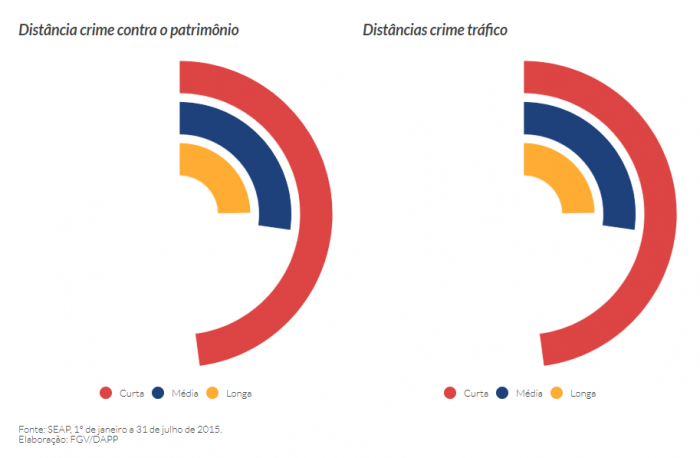 According to the survey, the distances covered by offenders convicted of robbery, theft, extortion, or drug trafficking, considering the universe of prisoners in the first half of 2015 — latest available data —, were located mainly in a corridor of up to 12 kilometers, less than the length of the Rio-Niterói Bridge. These types of crimes account for 72% of offenses that have led to convictions in the state. In this context, the North side of the capital is the region with most short-range trajectories (0 km to 12 km) between the prisoner’s residence and the crime scene, compared to average paths (12 km to 24 km) or long paths (24 km to over 40 km). The list indicates that the cost of crime — travel expense and the risk at the time of escape — can be taken into account. In addition, another issue related to the proximity of the self-declared residence of the criminal and the area of the offense may be linked to the alleged guarantee of protection by the criminal organization to which they belong or which controls the region. “The analysis of those trajectories can help us understand crime dynamics in the city, while also providing insights for preventive police patrolling and investigations. Combined with other public safety databases in Rio, this information can be helpful to implement public policies driven by the use of data and analyses,” said researcher Ana Luisa Azevedo. In the case of crimes against property (theft, robbery, extortion, etc. ), the following two areas stand out: Downtown and Grajaú and vicinity. In the first, there are short paths in the region itself and in Maré. In the area covered by the police station of Grajaú, we see a predominance of short paths, but also a confluence of convicts from adjacent neighborhoods of the city of Rio, both in the North and in the farther West side. Regarding drug trafficking, the preponderance of short distances remains, but there are other groups in neighborhoods in the West side, as well as a web that covers most of the coastal West side areas and the South side. The areas with most convictions for drug trafficking crimes were located in the neighborhoods of Bangu and Taquara and the surrounding areas, both in the West side. The farthest trajectory comes from the South side and the area of Ilha do Governador, in addition to some neighborhoods in the North side closer to Downtown. The medium trajectory comes from districts around the Baixada Fluminense area, in addition to more distant districts in the West side itself. Short paths are also predominant in the Taquara area, especially those that go towards the Barra da Tijuca area, through Cidade de Deus. In addition to not being as predominant, medium and long trajectories do not have a clearly defined pattern. The information regarding distances covered between the residence of prisoners and crime scenes can be powerful instruments to pinpoint criminal motivations and dynamics. It is important to understand that the place of origin of the individuals who commit crimes and their trajectories and flows within the city can be key elements to develop prevention policies. In addition, they can assist in the process of police investigation, seeking to identify patterns and relationships between different events. This information can be used along with other public safety data sources, in accordance with the prospect of police actions guided by intelligence with the use of several sources of information for decision-making. The study was based on SEAP data from 2015, when there was the last update, covering 1,644 prisoners of legal age who were convicted in 2015.